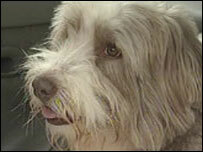 A bearded collie from Tyneside has undergone the UK's first canine knee replacement operation. Grace, from Whitley Bay, struggled to walk because of crippling arthritis which has left her in constant pain. The seven-year-old was referred to a specialist veterinary practice in Solihull, West Midlands. Her owners hope the procedure, which was carried out at Willows Referral Service on Wednesday, will restore Grace to an active, happy life. Hip replacement operations have been performed on dogs for many years, but no knee replacements have ever been carried out on dogs in the UK, according to a practice spokesman. Orthopaedic veterinary surgeon Malcolm McKee said the three-hour operation had gone well. He said: "From a surgical point of view we are very pleased that we got the artificial knee implanted successfully. "She is now recovering well from the anaesthetic." He said the £4,000 operation had been carried out by a team of specialist vets, one of whom had been trained to use the new knee replacement equipment in America.